CELEBRATING HIS 95TH BIRTHDAY: Keith Denham. HAWKS Nest resident Keith Denham likes to claim St Patricks Day as his own, the reason, it’s also his birthday. 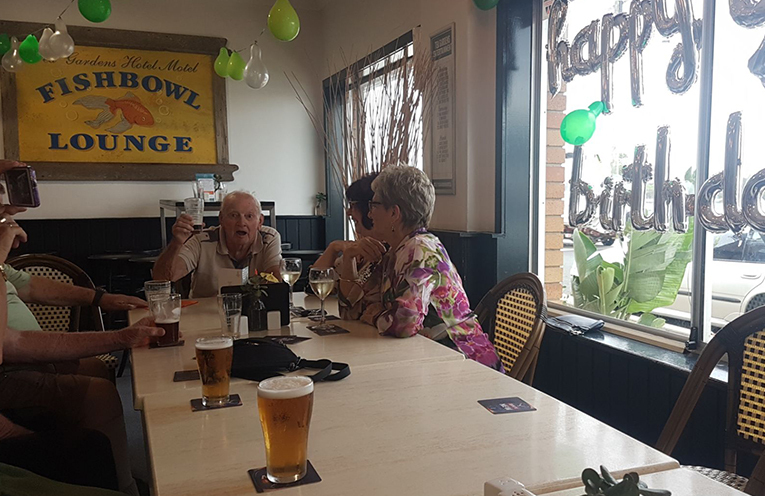 This year Keith turned 95 and family and friends helped him celebrate the occasion at the Tea Gardens Hotel, among the gathering Keith’s good mate, Geoff True. “Keith is an incredible man who has more stories and yarns than the Encyclopaedia Britannica and is quite happy to share his stories and if you have a good one, he has a better one,” Geoff said. For many years, Keith has been the ‘Doyen’ of the so called ‘Table of Knowledge,’ holding court in the ‘fishbowl’ at the pub. On his birthday, Keith had umpteen messages from his children, grandchildren, great grandchildren and great great grandchildren and is looking forward to getting a message of congratulations from the Queen in five years time. As for the birthday boy, he enjoyed every minute, “I should have a birthday every day, I got kisses from the women and the occasional man and I didn’t once have to pay for a beer”.